Imagine siting in these chairs and overlooking Adams Creek. Launch your kayak from your own private beach. Entertain on your stone patio next to the gas log outdoor fireplace. This could all be yours. Located at 115 Staysail Lane in Beaufort, NC - this custom built waterfront home has over 4,000 square feet. Enter through the front door into the grand foyer that flows into an open living room overlooking the water. The list goes on to include decorative concrete floors. Cooks kitchen w/granite countertops, stainless appliances - including gas cook top, farm sink, subway tile, pot filler & kitchen bar. Did we mention the Breakfast nook & two pantries? Off the living room is a library/office area w/built-in bookshelves. Main floor master bedroom with french doors leading out to private patio overlooking the water. Large master bath w/garden tub, glass shower & double vanity w/granite counter tops. Two bedrooms upstairs with full bath & game area that has refrigerator & bar area. Large art studio or work area over the two car garage. Wood Shaker shingle siding for easy maintenance. Check out the video below for more details. To schedule your private showing - contact us at Larry@crystalcoasthomesearches.com. 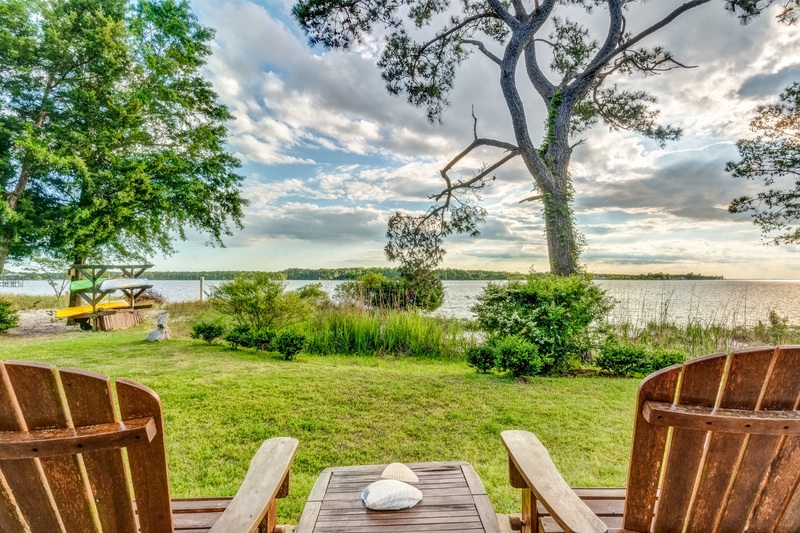 To view all the properties for sale in Beaufort, NC click here.